This is a blog, so let me start with the best new Islay blog on the scene, an easy decision: The Islay Natural History Trust blog. From a quite unspectacular start back in May it has quickly developed into a daily and very enjoyable read. Right, this was a tricky decision. It was a head to head between Laphroaig and Bruichladdich. My favourite whisky as such was the Laphroaig Triple Wood, but then it was released in 2009 (at least I first tried it in 2009). So I decided to give this years award to the Bruichladdich Port Charlotte An Turas Mor. After the PC5, 6, 7 and 8 this is the latest (and if I understand correctly final) version of the Port Charlotte line. It has the warm and fiery taste I like so much. I understand he only moved to Islay this year, but some of the pictures I've seen from him are just fantastic: I'm talking of James Deane. If you don't have a Facebook account and can't see his pictures there (I'm not sure if you need an account), some of his pictures are available on Ron's weblog, Down Came the Meteor Seen from Kildalton Islay, Amazing Islay Night Sky at Bunnahabhain and Amazing Islay Winter Images by James Deane. I hope James will join the ranks of the photo bloggers and make some of his best pictures available for everyone outside of Facebook in 2011. Now we're getting rather personal, as I have to pick my sister here. In June this year she joined me on Islay for a week of the two weeks I spent on Islay in June. We just had a fantastic time. Of course helped by the weather, but Imke (that's her name, for those who don't know her) had some great enthusiasm and energy. She isn't really used to hillwalking, yet she joined me on a 10 hour walk from Killinallan to Mala Bholsa as well as great walk along the Sound of Islay on Jura. Thank you, Imke! Many people raised funds for all kinds of good causes on Islay, so it was difficult to pick out one particular one. 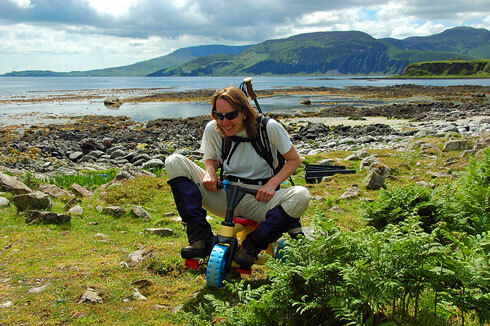 But this one just sticks in my mind, Eleanor and James Crossing Scotland Coast to Coast. Admittedly I'm slightly biased as I've known both of them for many years now, but for me it was a great idea well executed I could follow online. Many people these days are talking about ‘social media’, things like Twitter and Facebook. Many are using these ‘new’ tools, in particular some of the distilleries on Islay and Jura. Bowmore (Bowmore on Facebook, Bowmore on Twitter) is quite active, Laphroaig (Laphroaig on Facebook, John Campbell of Laphroaig on Twitter) is doing a great job but I've decided to go for the folks at Isle of Jura. Some great stuff on Twitter with jura_whisky and Facebook with The Diurachs. Competitions, comments, reactions, new ideas regularly. It's not perfect (and I don't think any of these can ever be), but I think their team is really working hard on it. I'd like to see a little more directly from Jura (like in particular John and Margy are doing for Laphroaig), otherwise their tiny lead over Laphroaig will soon evaporate. Ha, this is the one without a winner. Because it would be wrong to pick anyone in particular. It's all of you. The many people I've met on Islay and Jura (from Islay, Jura and elsewhere). The many people who've sent me comments, input or feedback, be it via e-mail or in the comments. The many silent readers and visitors to this blog and my other Islay sites. The many people who have shared their pictures, videos and experiences of/on Islay and Jura online. All of you together made this a great year. Each of you matters. For those of you who were still expecting a Friday Islay picture today, this is kind of it. And yes, I will post a larger version on the Islay Pictures photoblog on Saturday morning. As I've mentioned above I had a great time with my sister on Islay and Jura in June 2010, this picture was taken during our walk along the Sound of Islay from Jura House to Feolin Ferry. Great landscape, good weather and most importantly we had a lot of fun! So far for my Islay and Jura 2010, I hope you've enjoyed it. Of course you will have had your experiences and favourites, if you want to feel free to share them in the comments. Happy New Year! Frohes Neues Jahr! Bliadhna mhath ùr!